The space shuttle Enterprise is seen shortly after the grand opening of the Space Shuttle Pavilion at the Intrepid Sea, Air & Space Museum on Thursday, July 19, 2012 in New York. NEW YORK — The Intrepid Sea, Air and Space Museum's brand-new exhibit showcasing the space shuttle Enterprise officially opened to the public today (July 19), and hundreds of excited men, women and children waited patiently in line for the chance to get up-close and personal with the city's newest and most impressive space artifact. To celebrate the opening of the new Space Shuttle Pavilion, the Intrepid hosted a special ceremony Thursday morning at the museum here, which is located at Pier 86 on Manhattan's West Side. "It is an exciting time for the Intrepid and for all of New York City," Susan Marenoff-Zausner, president of the Intrepid museum, said during her opening remarks. "For so long, we have dreamed of bringing a shuttle to New York, and we are so incredibly excited that this day is here." Also present at the opening ceremony were NASA chief Charles Bolden, Ken Fisher and Bruce Mosler, co-chairmen of the Intrepid, and three of the four original Enterprise pilots, Richard Truly, Joe Engle and Fred Haise. The fourth pilot, Gordon Fullerton, was unable to travel, but was represented by his wife, Marie. NASA’s space shuttle Enterprise, the space agency’s original prototype for its winged orbiter fleet, opens on display at the Intrepid Sea, Air and Space Museum in New York City on July 19, 2012. Click here for more photos. The shuttle Enterprise never flew in space, but the prototype orbiter was used by NASA in the late 1970s for approach and landing tests for the then-nascent space shuttle program. Before coming to the Intrepid museum, Enterprise was on display at the Smithsonian's National Air and Space Museum annex just outside Washington, D.C.
Enterprise was awarded to the Intrepid in April 2011. The Smithsonian received the space shuttle Discovery, NASA's most-flown orbiter, to replace Enterprise in its shuttle exhibit. The Intrepid exhibit's layout, which includes a raised platform for people to stand level with Enterprise's nose, allows visitors to fully appreciate the sheer size of the shuttle by walking underneath and all the way around the vehicle. "It's bigger in real life than I would have thought," said Denise Vollert-Parrotto of New Jersey, who attended the opening of the Space Shuttle Pavilion with her husband and 4-year-old son Nicholas. "Getting close to it, I think they did a really nice job here at the Intrepid." Vollert-Parrotto took Nicholas, who she said is fascinated by ships and airplanes, to see Enterprise as it flew into New York atop NASA's modified 747 carrier aircraft. As the family snapped pictures in front of Enterprise, the 4-year-old marveled at the display. "I want to ride on it!" Nicholas told SPACE.com. 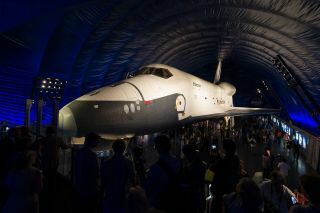 Having seen the space shuttle Enterprise as it made its way to the Intrepid, Vollert-Parrotto felt it was important for her son to see the orbiter in its new museum home. "He was lucky enough to get to see it when it came, and it's a historical moment," she said. "We've talked about the shuttle a lot ever since we knew it was coming, so he was really excited to come." Nicholas' excitement was shared by many, as people eagerly awaited their chance to gaze up at the 122-foot-long (37 meters), 150,000-pound (68,000 kilograms) shuttle. "It's amazing," said Evan Kaplan, 9, who was dressed in an orange spacesuit costume. "I never thought a space shuttle would be this big." To coincide with the opening of the Space Shuttle Pavilion, the Intrepid is also hosting "SAMSUNG SpaceFest," an event that invites people to experience more than 40 interactive displays, activities and exhibitions. The SpaceFest will last through Sunday (July 22), and is free with admission to the Intrepid museum. As the pavilion doors were opened to the public for the first time, the crowds enthusiastically welcomed Enterprise into its new home at the Intrepid. "In a city where so many things are born, engineered, developed and celebrated, it is so fitting that Enterprise finds her home right here in midtown Manhattan," Marenoff-Zausner said. "She represents the birth of an era, a revolution in science, research and discovery. She stands for risk, for chance and courage, and she is truly intrepid."